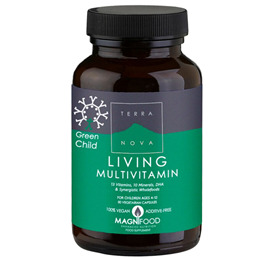 TERRANOVA Green Child Living Multivitamin is a comprehensive vitamin and mineral complex for children ages 4-12. It has been enhanced with highly active, whole and unadulterated superfoods and botanicals, many of which are fresh freeze dried. SRB has one of nature`s highest concentrations of the vitamin E-related compounds tocopherols and tocotrienols, as well as B-vitamins, fibre, essential fatty acids, minerals and more than 100 different compounds possessing antioxidant activity (such as alpha lipoic acid [which also recycles antioxidants such as vitamins C and E], coenzyme Q10 (CoQ10), carotenoids and the antioxidant enzymes superoxide dismutase (SOD), peroxidase and catalase). Spirulina plankton is one of nature`s richest sources of plant pigments (such as chlorophyll, carotenoids and phycocyanin) and highly digestible protein (typically more than 55%), as well as providing vitamins and minerals, fatty acids and other compounds vital to life (such as the powerful antioxidant enzyme superoxide dismutase [SOD]). Each Terranova nutritional product is enhanced with its own synergistic complex of botanicals and phytonutrient-rich foods, called Magnifood. Magnifood ingredients are combined in a manner which enhances the body`s biochemical environment in order to maximise the potential benefits of the product`s vitamins, minerals and/or other nutrients. Many of the plants used in Magnifood are fresh freeze dried. Research shows that fresh freeze drying has the unique ability to retain a plant`s enzymes, and is shown to be superior to other drying methods in terms of activity, stability, solubility and preservation of a plant`s original fresh chemistry (as it was when the plant was harvested). Providing a vast array of phytonutrients that enhance the potential functions and/or applications of the product. Spirulina (spirulina platensis - organic), Stabilised rice bran solubles, Beetroot juice/greens (freeze dried - organic), Blackberry (fresh freeze dried), Spinach (fresh freeze dried - organic), Broccoli sprouts (fresh freeze dried - organic), Watercress (fresh freeze dried), Dandelion leaf (fresh freeze dried - organic), Vegetarian capsule shell, Vitamin C (as Ca, Mg ascorbate), Calcium (as carbonate, ascorbate), Magnesium (as oxide, ascorbate), DHA (vegan source - from algal oil), Niacinamide, Vitamin E (d-alpha tocopheryl succinate), Pantothenic acid (as calcium pantothenate), Iron (as bisglycinate), Zinc (as bisglycinate), Vitamin B22 (riboflavin), Vitamin B6 (as pyridoxine hydrochloride), Vitamin B1 (as thiamin mononitrate), Manganese (as bisglycinate), Vitamin A (as palmitate prep), Copper (as gluconate), Folate (as calcium l-methylfolate), Iodine (as potassium iodide), Biotin (as prep. ), Selenium (as selenomethionine), Chromium (as picolinate), Vitamin K1 (as phytonadione prep. ), Vitamin D3 (vitashine cholecalciferol), Molybdenum (as sodium molybdate), Vitamin B12 (as methylcobalamin). As a food supplement for children ages 4-12 years, take 2 capsules daily with food. For Children who cannot swallow capsules, the contents of the capsule can be emptied into juice, a smoothie or yoghurt. Below are reviews of TERRANOVA Green Child Living Multivitamin - 50 Vegicaps by bodykind customers. If you have tried this product we'd love to hear what you think so please leave a review. Excellent product, have actually brought my daughter's ferritin level up due to high amount of iron in it. I'm buying this vitamins twice a year for my children and can see various improvements after taking it. 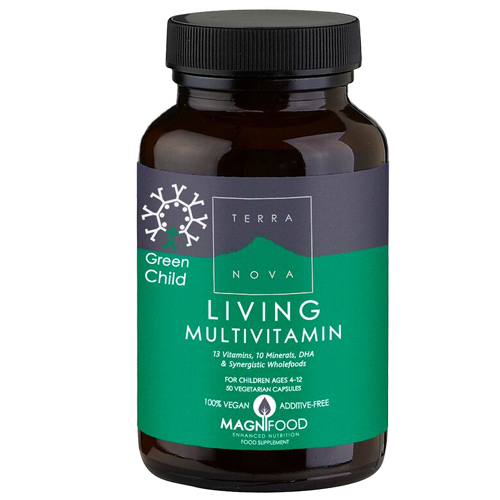 TERRANOVA Green Child Living Multivitamin is a comprehensive vitamin and mineral complex for children ages 4-12, enhanced with highly active, whole and unadulterated superfoods and botanicals.